wrote Siegfried Sassoon in 1917, in a brutal fantasy about forcing civilians to understand the reality of war. Yesterday afternoon at the Oxford Playhouse, I saw Sassoon’s vision made real. At the end of the second act of O’Casey’s The Silver Tassie, the monstrous tank that has dominated the set begins to lurch forward threateningly, and just as you think it is going to crush the first row of the stalls, there is an almighty explosion, and then a blackout. You can’t accuse the Druid theatre company of failing to put across O’Casey’s pacifist message with gusto and commitment. But you are not interested in the Great War; you never stood on its battlefields, never walked in its hospitals, and so write out of your opinions [….] The mere greatness of the world war has thwarted you, it has refused to become mere background and obtrudes itself upon the stage as so much dead wood that will not burn with the dramatic fire [….] Among the things that dramatic action must burn up are the author’s opinions. A programme note to the current production points out that O’Casey’s brothers were soldiers, and that he had spent time in hospital with men wounded in the War, but there does indeed seem to be a gap at the heart of the play. O’Casey would have been well-equipped to write a play closely examining Dublin’s reaction to the War, but he wants to include the battlefield itself. To do so, he steps outside his own experience, and writes a scene of expressionist nightmare, a pantomime of military suffering, where a madman rants religious prophecies, staff-officers strut and a victim-soldier endures Field Punishment. The problem facing a director is how this relates to the rest of the play. You can either present the Dublin scenes as naturalism, and Act II as total contrast, or you can do what Garry Hynes has done in this Druid production, and let the expressionism seep into the other scenes; the first act ends with a big son-and-dance number, and the play’s chorus, the old men Simon and Sylvester, are played as a music-hall double act. I can see why the director made these choices, but I don’t think she solves the play’s problems. The most significant of these is that the characters who should bear most of the play’s emotional weight are under-written. Harry is the star footballer who becomes crippled by war; Jessie is the girl who rejects him when he loses the use of his legs. Aaron Monaghan is a strong presence as Harry, but the play gives him so little to work on in the first act that we cannot care about him as much as we should. The actress playing Jessie is given no hinterland of motivation to work with at all. This is just a shallow girl, all over a star footballer, but dumping him when someone sexier comes along. The change in her feelings happens offstage; O’Casey allows us to assume that her motivations are trivial. So is it really a tragedy that Harry has lost a girl as worthless as this? Instead of building up these central characters in the first act, O’Casey gives us some broad comedy about Dublin types. For the first quarter of an hour, we see little except for the two chattering old men, Simon and Sylvester, and Susan Monican, a hard-working young woman who expresses her disapproval of this pair of layabouts through her fierce religion. In this production Eamon Morrissey and John Olohan do an immensely skilful job of presenting the pair of wasters as a music-hall double-act (I was reminded of Ian McKellen and Patrick Stewart doing something similar with Beckett’s tramps in Waiting for Godot). They are tremendously active, though – and since in this play the contrasts between the active and the inactive, the lithe and the still, are crucial, I think this is a mistake. These men, old and neutered and talking, talking, talking while the women do the work, should be pretty near to supine, implicitly suggesting the only future that will be open to Harry when he has lost the use of his legs. It is the females who should be energetic through the start of this act, whether the puritanical Susan Monican or the hapless Mrs Foran, who fails miserably to cook her husband a decent supper. When male energy finally erupts into the play, it is destructive and useless. Teddy Foran, enraged at the ruin of his meal, smashes all the china in their apartment. Then in come the footballers, wild and tribal, with Harry as their hero and Jessie clinging lustfully to him. Harry drinks from the silver tassie, and dresses for war. When he leaves, we have seen him in his glory, but O’Casey has given us no clue about what impels him so fiercely on the football field, and – more significantly, I think – has not told us why he volunteered for war (since there was no conscription in Ireland). Was it for economic reasons, like many Irishmen in hard times? Or from a desire for adventure and glory? Or did he believe in the cause? O’Casey leaves this important question unexamined. The second act is the expressionist battlefield fantasy, daringly using the fracturing devices of theatrical modernism to preach a strident message. It is a collage of song, wild ravings, broad comedy and pointless violence. Officers are caricatures, soldiers are tortured victims. A great gun dwarfs the humans, and to me the script seems complicit with the gun’s violence, in that, like the war it disallows the characters full humanity. These are nor the men we leaving Dublin in the first act, but a generic group of typical soldiers, seemingly cockney, with little individuality. The act has moments of effectiveness, and may well have been more striking in 1929, when expressionist techniques were less common in the theatre, but it seemed to me yesterday what it seemed on the page, dramatically inert. To understand O’Casey’s failure in this scene, we could compare it with another war collage, David Jones’s In Parenthesis written at about the same time. Like O’Casey, Jones interweaves religion, realism, symbolism and suffering into a poetic battlefield collage; the difference is that Jones’s words come from his intense aural memory, not from his political opinions. The speakers of In Parenthesis are wonderfully diverse, and Jones’s amazing aural memory enables him to individualise them. Their moods and reactions are equally diverse. By comparison, O’Casey’s soldiers are the products of indignant imagination, created to convey his message, not their own. The third act goes back to Dublin, and the kind of civilian hospital where O’Casey mey wounded soldiers while he was a wartime patient. We meet Simon and Sylvester again, and in this production their hyperactivity is beginning to get a little wearisome. O’Casey obviously enjoyed writing these two, and indulged himself. Religious Susan is now a nurse, and Harry, crippled, waits desperately for Jessie to come to him, but she lingers with undamaged Barney below. O’Casey doesn’t not show us the crucial scene between her and Barney. Is she as blameworthy and shallow as Harry thinks? Did Barney have to persuade her? What are the needs that drive her to do something that she must know is cruel? There is material for drama here that O’Casey has avoided, and I’m not sure why. The last act shows a dance at the football club. We see the effects of war, not just on embittered Harry, but on Teddy Foran, the violent husband of the first act. In that act, Brian Gleeson gave a powerful performance as the big irrational man who dominated his terrified wife. Now he is blind, and she is in control. Once again I was reminded of Beckett, and the reversal in fortune of Pozzo and Lucky. This production conveys this brilliantly. All Harry can do in the last act is rant and feel sorry for himself. Aaron Monaghan shows us the character’s pain, but can’t raise him to tragic dignity. His destruction of the tassie seems like the frustration of a spoilt child who can’t get what he wants. His story finally isn’t big enough to hang a denunciation of war onto. It’s O’Casey’s desire to denounce that is the problem, I think. He so much wants to be anti-war that he skirts painful political issues that his best plays would have confronted head-on. Why did these men join up? What is their relation to republicanism? The play is set, I think, in 1915. After the 1916 Easter Rising, when British troops were policing Dublin, many Irish soldiers were given a hard time when they returned home from war. I don’t think there is any hint of this source of friction in the play. But if Harry had lost the use of his legs in a conflict that most no longer believed in, that would surely have been an issue worth exploring. O’Casey has taken his eye off the details because he wants to make the big statement. Garry Hynes’s production legitimately backs him in this, and gives Act II the full expressionist works. To what effect? Was one member of the Oxford audience yesterday led to think: “War is dreadful – I never realised that.”? Or did we sit back and enjoy our usual opinions being endorsed? The attack of the tank and the big bang at the end of the act is a marvellous coup de théatre – but the impression it made on us was physical, not intellectual or emotional. We stared at each other with pleasure at having been shaken – as one might at the end of a roller-coaster ride. And yet – I’ve been negative about aspects of this production, but it is well worth seeing. The director has made firm decisions that I don’t always agree with, but they have made me think through my feelings about the play, which I like more after having seen these spirited and committed actors at work on it. This entry was written by George Simmers and posted on September 24, 2010 at 3:55 pm and filed under novels, Theatre. Bookmark the permalink. Follow any comments here with the RSS feed for this post. Post a comment or leave a trackback: Trackback URL. Thank you, George Simmers, for your very insightful review of this production. I agree with just about everything you say. I saw the Saturday matinee at the Oxford Playhouse, and must admit I was disappointed. I found the heightened acting (was this supposed to be a nod to Brecht’s Alientation Effect?) really jarred. At first, I thought the two old men were rehearsing a play, a parody of Oirishness. Susie Monican was a caricature from start to finish; I felt that Clare Dunne had no sympathy for the character she was playing. Yet Susie has the potential to be an interesting character: a woman desperately clinging onto myths — first her hellfire religion, then her transformation into an English lady. There is a small element of choral speaking in Acts 1 and 4, but I still think that a naturalistic style would have worked better than this choreographed, somewhat shouty approach. The Expressionistic second act worked well, in spite of dodgy English accents. The ensemble work was excellent, the songs poignant. The text could have done with a little pruning in Acts 1, 3 and 4, particularly as parts of the play are repetitious rather than enlightening. I, like George Simmers, would have liked to have witnessed Jessie’s growing antipathy towards the paralysed Harry, and her desertion of him. There must have been at least a moment of internal conflict, some qualms, some regrets. To depict her as a shallow minx is just lazy, though Ooife Duffin made the best of her sketchily written part. Derbhle Crotty sticks in my memory. She inhabited the role of Mrs Foran, a sparky woman with a violent, destructive husband, who develops into the tough, wife of a blinded soldier, drinking herself to death. I came away intrigued by the relationship between the English and the Irish at this time, when the struggle for Irish independence was at its height. Susie’s mangled vowels, as she tried to anglicise herself to attract the English doctor, are barely commented on by the other characters. Yet surely she’s a kind of traitor to the cause. 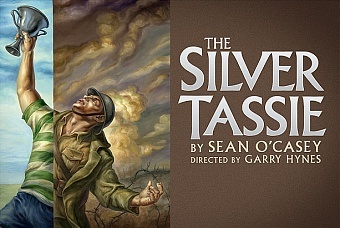 The fact that the characters in Act 2 are Tommies — the same Tommies as feature as the enemy in O’Casey’s Shadow of a Gunman, shows magnanimity on O’Casey’s part, and also demonstrates that, when the play was written, Ireland was a free state and had ‘moved on’ from earlier antagonism. I hope that this great writer’s other plays will soon have a long-overdue revival. I definitely agree with you about Derbhle Crotty as Mrs Foran. The transformation of her character made her the most interesting person in the piece. I wish O’Casey had written a whole play about her. just come in from the cork production of silver tassie. I must say i agree with your expressed opinions about this play. the problems are with o casey’s characterizations and preachy tone. I didnt like the beckett effect right from the start. i found the two clowns a boring borowing and the tin hat rioutines in act 2 were the last straw. By act 2s end i was running to the carpark. druid need to choose more carefully, its an expemsive gamble. the theatre was full and for druid and theatre’s sake i am glad it is having a good run. I have seen a production of the play many many years ago and act 2 impressed me more than than now but i put that down to the reality of ongoing wars more than to fictionals from what is almost a 100 years ago.